Learn how you can use Data-Driven Testing to obtain and use data during test execution with Testsigma in this tutorial. In Data-driven Testing, we keep the Test Data separate from Test Cases to meet maintainability and security concerns for test scenarios that depend on a lot of external data. This is achieved with the use of test data profiles (the equivalent of external data stores such as JSON or CSV files). We have talked about regular Data Driven Testing using Testsigma in a previous article. But what if we need to get data at runtime, i.e. during test execution? That is, what if we need to get data from the result of a previous test step and use it in the current test step? This is where the Runtime Test Data feature comes handy. Runtime Test Data is used to store data obtained during runtime, i.e. during the execution of test cases, for use in a test step that comes later. The ability to fetch test data at runtime increases the robustness and flexibility of Tests. For example, the title of a webpage can be checked before and after an operation is carried out on the page (for example, page reload) using a runtime data check. 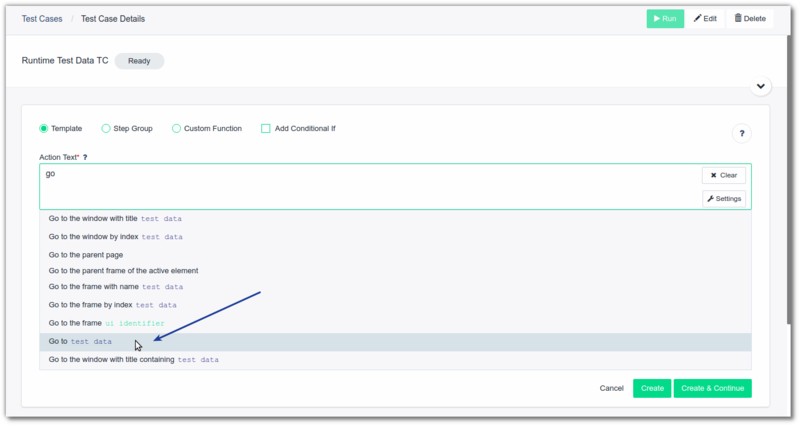 After logging into your Testsigma account, navigate to the test cases page by going through Select Project > Select Application > Select Version. 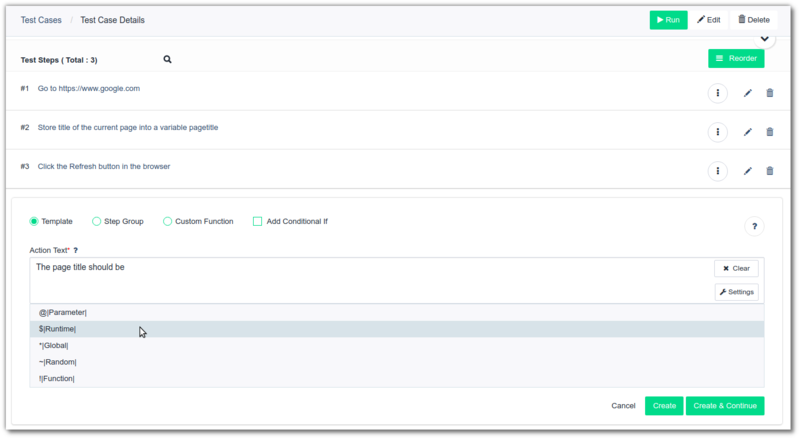 On the Test Cases page, create a test case with a suitable name using the "+ Test Case" button in the top right corner. We will be taken to the Test Case details page. Click on the Create Test Steps button to open the Create Test Step wizard. Start by entering "go" in the Action Textbox to get the suggestions as shown below. Select the template: go to test data and replace test data with https://www.google.com. Click on the Create and Continue button to save the current step and create the next step in a single click. The Test Step wizard starts a new instance and we can create the second step now. Replace test data with a variable name, such as pagetitle, and create the step. Select the $|Runtime| parameter and enter the name of the variable where we store the page title, i.e. pagetitle. We have successfully created a test case that verifies the title of the Google homepage using runtime test data. That's all we need to use runtime test data using Testsigma. Welcome to the era of #SmartTestAutomation with Testsigma!